The Korean flag is an aesthetically beautiful piece of art. A deep red and blue Yin Yang attract your eyes to the center as it sits atop of a crisp, bright white background. Between the center and each of the four corners are mixture of solid and dashed black lines. But these elements and colors weren’t just accidentally thrown together. Like most national flags, the Korean flag is specifically designed to represent the values of its people and culture. 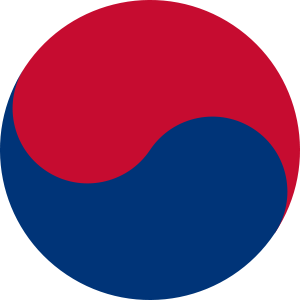 Located in the center of the flag is a common symbol that even most people in the West are familiar with – a Yin and Yang, which in Korean is called a Taegeuk. The Yin and Yang, or Taeguk, stem from one of the most ancient Chinese texts called the I-Ching, the oldest manuscript of which ever found dates back to around 475 BC. Other famous Eastern philosophers have since written about the Yin and Yang, most notably of these have been Tao, Confucius and Buddha. The Yin of the Korean flag (called Um) is depicted by the color blue, representing dark and cold. The Yang is red and represents the Yin’s opposites, bright and hot. Also adapted from the I-Ching, the Korean flag uses four of eight trigrams. These black trigrams reside on the outside of the Taeguk. Each trigrams represents a natural element as well as a season, direction, family member and a personality trait. ‘Geon,’ the trigram located on the top left, represents the element of heaven as well as the sky, spring, east, humanity, father and justice. The bottom left symbol, ‘Ri,’ is fire, the sun, autumn, south, justice, daughter and fruition. ‘Gam’ is located on the top right symbolizing water, the moon, winter, north, intelligence, son and wisdom. And last is ‘Gon’ at the bottom right representing earth, summer, west, courtesy, mother and vitality. It wasn’t until after the Japanese occupation of Korea that the country was able to make their own national flag. Korea did have flags before then, the first one was designed in in 1882, but when the country was annexed by Japan in 1910 any and all forms of their flag were banned. In 1948, three years after the defeat of Japan in World War II, Korea was finally able to construct a flag that their people could proudly stand by. That flag is the one that stands today.